Israeli Police continue to prevent Jews from visiting Judaism's holiest site. Witness: we were humiliated because we were Jews. Giving in to Islamist intimidation? Out in the hot sun, a group of middle-aged Jewish-American tourists were forced to wait to ascend the Temple Mount -- just for being Jews. "It was a humiliating and outrageous experience," said Helen Freedman, the leader of today's (Monday) group. "Because we were Jews and we wanted to go up [to the Temple Mount] as a group of Jews, we were kept waiting for 2 hours. Even then, only 10 people were allowed to ascend the Temple Mount." Freedman continued to explain that not everyone from their group ended up being allowed to see Judaism's holiest site, and were forced to endure terrible discrimination as they waited in the searing Middle-Eastern sun. "We were subjected to Arabs who were screaming 'Allahu Akbar!' to us the whole time while we waited." The tour was being conducted by the American Friends for a Safe Israel, a pro-Judea and Samaria group dedicated to Jewish rights in all of the State of Israel. Freedman is the organization's founder and Chairman. "In the Jewish State, to be discriminated against by the [Jewish] Police, is unacceptable [. 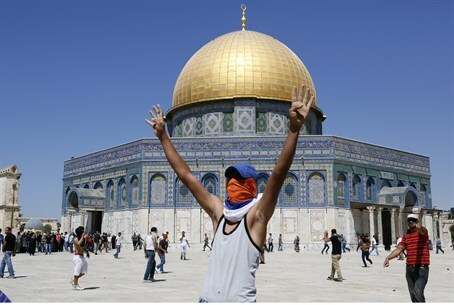 . .] we are going to return to the US and work tirelessly for the Jewish right to ascend the Temple Mount," Freedman said. Rabbi Chaim Richman, Director of the International Department at the Temple Institute and the group's guide on the Mount this morning, reiterates that "The deliberate and calculated discrimination against religious Jews employed by the Israel Police at the Temple Mount, the Jewish people's holiest site, is inexcusable and intolerable." Richman adds a call for action: "The government of Israel, from whence these orders originate, must be held accountable. Such practice, if perpetrated against Jews in any other nation, would be branded by the State of Israel as blatant anti-Semitism. Sadly, the only place where this most odious form of anti-Semitism is practiced daily, is in Jerusalem, Israel, at the Temple Mount." Today's events follow a string of tightening restrictions for Jewish temple mount visitors, which has escalated this week. Despite being among one of Judaism's holiest sites, Jews are subject to severe restrictions on the Mount, due to the presence of an Islamic complex, administered by the Waqf Islamic Trust, and threats by Islamist groups. The Israeli police are able to bypass court decisions upholding the Jewish right to prayer or religious activity there by citing unspecified "security concerns"; the result has been a ban for individual activists, and often blanket prohibitions on Jews ascending the Mount at all. Non-Jewish visitors, meanwhile, face no restrictions on the site. While a proposal has been made for equal management of the Mount for both Arabs and Jews, no practical measures have yet been taken.